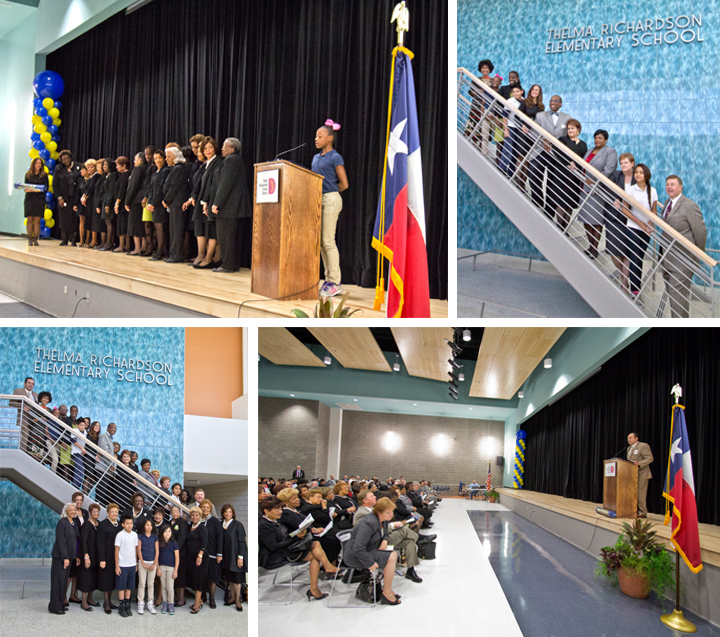 BRW Architects attended the Dedication of Thelma Elizabeth Page Richardson Elementary School on October 23, 2013 greeted with handshakes from excited young students. The school opened this Fall relieving the over populated elementary schools in the area. The daylight filled Lobby proved the ideal setting for the Dedication events! The inspiring speeches encouraged students to model their school’s heroic name sake; Thelma Richardson who fought for equal pay for African American Dallas teachers in the 1940’s. Principal Courtney Thomas led the Program in the Multipurpose space and was also joined by speakers Sylvia Reyna, PH.D. (Chief of School Leadership, DISD), Toni Rose (Texas House of Representatives), Rick Callahan (Dallas Council Member), John Wiley Price (Dallas County Commissioner), Israel Cordero (Executive Director, W.W. Samuell Feeder Pattern DISD), Rita Cloman (President, Alpha Kappa Alpha, Inc.), and Larry Zerby (Director of Design & Special Projects, DISD, Construction Services). The performances by the enthusiastic 4th and 5th grade choirs were met with great applause concluding the ceremony. Afterwards, guests and parents enjoyed refreshments in the Lobby where they admired the CHPS educational graphics and the Thelma Richardson dedication signage including the history of the school’s name sake. It was inspiring to experience the school in use after all the planning, design, and construction was complete! The recently completed Thelma Richardson Elementary School opened its doors to teachers last week and will welcome Dallas ISD students for the first day of school on Monday, August 26. The new elementary school celebrates the life of the namesake, Thelma Elizabeth Page Richardson, and her role in breaking down the walls of teacher segregation in Dallas. Vibrant, colorful panels and durable materials provide the district with a new CHPS designed school that will last well into the future. Included are a few detailed images as we celebrate the school’s opening. More pictures will be posted on our website and blog soon, so be sure to check back at www.brwarch.com. 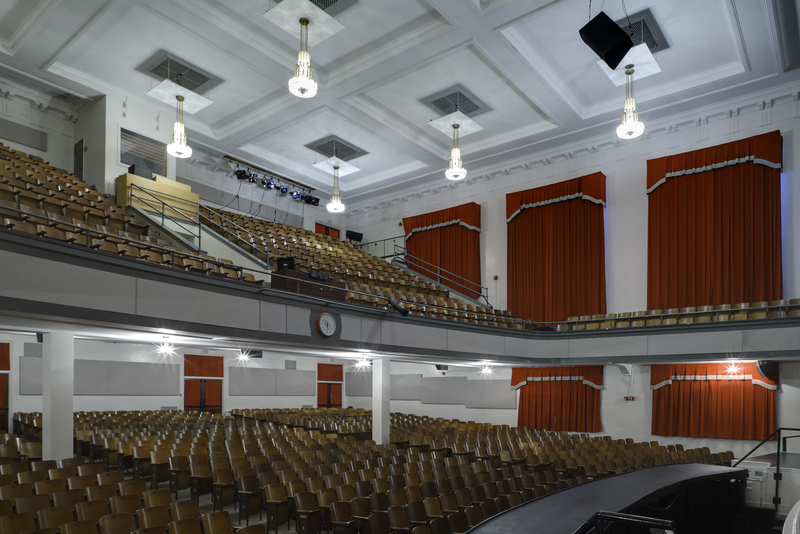 Craig Reynolds, FAIA will be speaking tonight about the extensive restoration that BRW Architects recently completed at Woodrow Wilson High School. The event, which is sponsored by Preservation Dallas is free for members and $20 for non-members. Reservations are required. Please contact Preservation Dallas at 214-821-3290 to RSVP. The Historic San Jacinto Memorial Building in Houston, Texas is a three-story 180,000 SF building originally built in 1914. Now a part of Houston Community College, the building is currently undergoing a complete interior renovation and is being redeveloped as an administrative and academic classroom building. BRW is currently in the process of restoring the historic exterior of the building back to the glory of its original design. 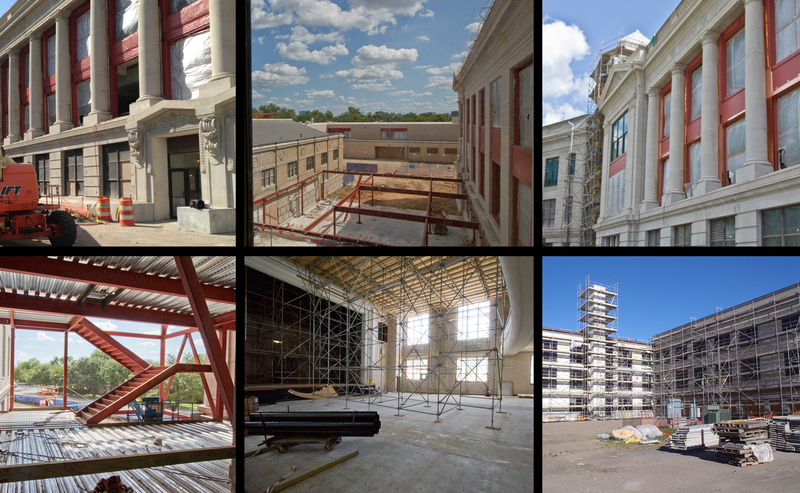 Additionally, the finished building interior design will highlight its history while creating state-of-the-art spaces for the College’s future academic and education environment. Wednesday afternoon was a gorgeous day to get out of the office. The sun was shining and the traffic was not nearly as tragic as I imagined. BRW principal and former CEFPI North Texas Chapter president, Lisa Lamkin, AIA and I drove together to Fort Worth ISD’s Polytechnic High School. We were scheduled to attend a CEFPI board meeting at the school and afterward have a quick lunch while visiting the High School’s new Community Garden. 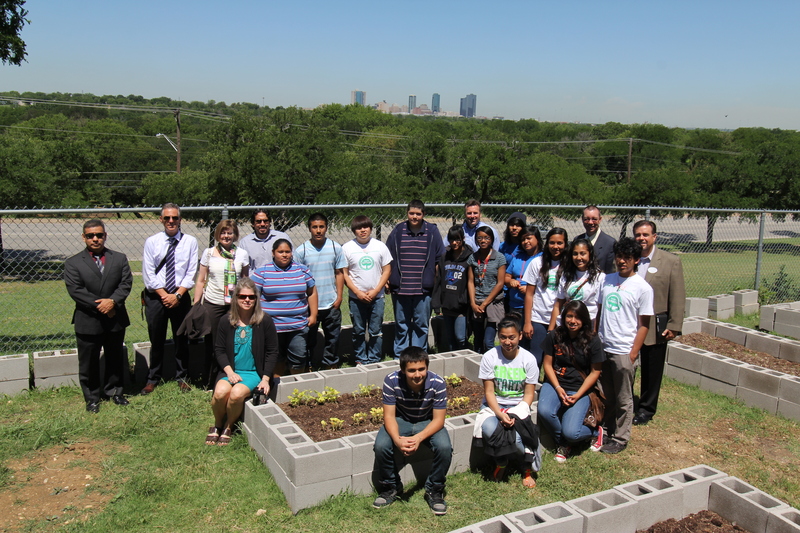 It was a little over a year ago that the school started their Community Garden with the award money they received from the CEFPI. 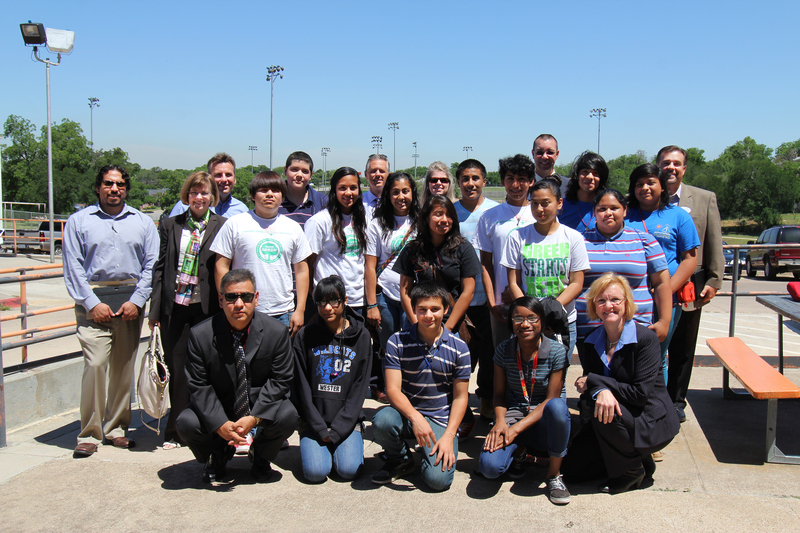 The real treat of the day was when the students proudly showed the CEFPI Board members around the different vegetables and herbs that they planted. The first CEFPI Impact award was a clear success and I look forward to seeing what school wins this year’s award, and what they will do to improve their school environment. The award application date has been extended to June 12 this year so if you know of a school in need, be sure to direct them here. 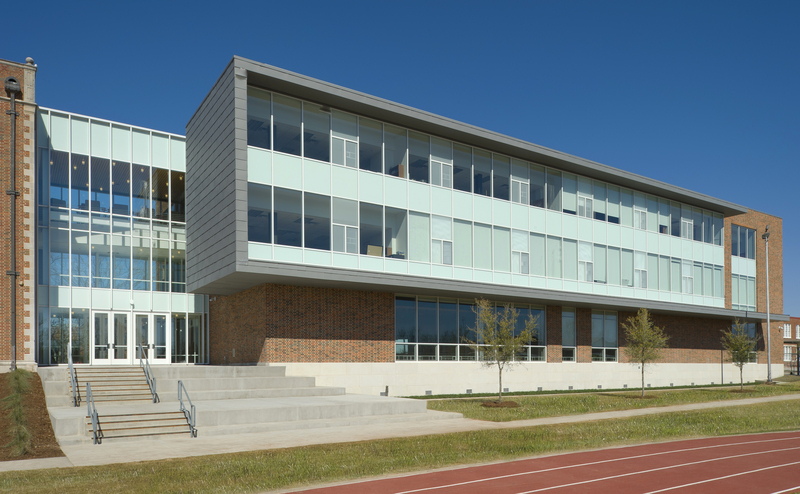 A ribbon-cutting and open house for the new Science/Performing Arts wing of Dallas ISD‘S Woodrow Wilson School is from noon to 3 pm on Saturday, March 23. 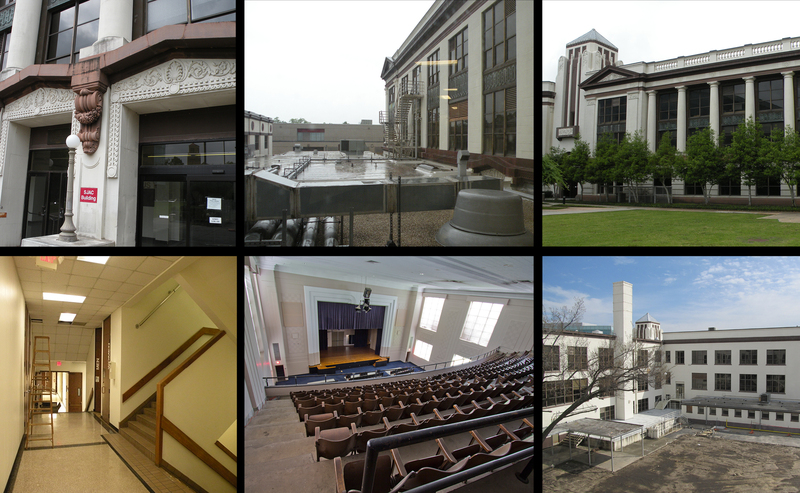 Congratulations to Dallas Independent School District’s Woodrow Wilson High School for winning an Achievement award from Preservation Dallas! 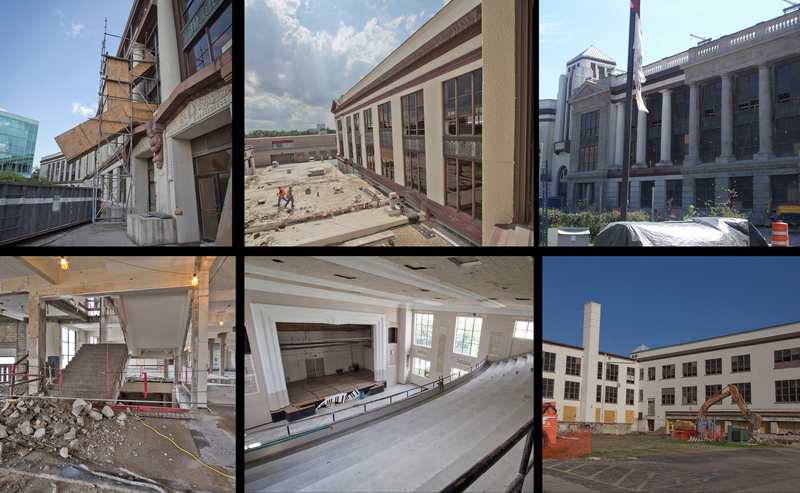 The award will be presented at the 14th Annual Preservation Dallas Achievement Awards ceremony on May 15th at the new Dallas City Performance Hall. Click here for more information about the awards and ceremony and to order tickets. View a PDF of the photos used in the presentation here.